Things are changing at “Suwannee Town”. Most interesting is that the Miller family has sold the marina bearing their name, and it’s now known as Gateway Marina. 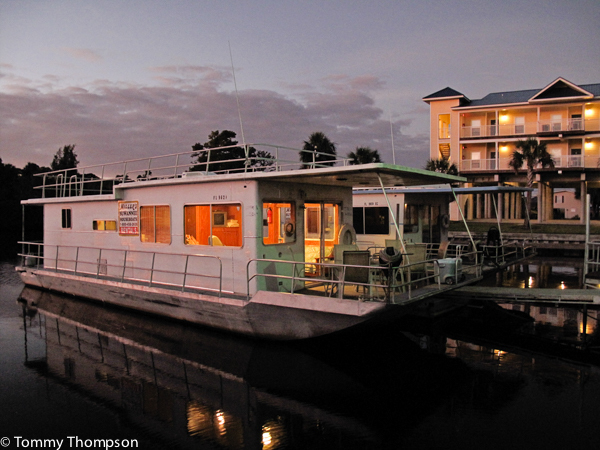 “Gateway” is a fitting term, as the marina is the closest to the mouth of the mighty river and to the Gulf of Mexico. Plans for the “new” marina include live bait (the tanks are in! ), fuel, food and an improved and fully-stocked ship’s store. Gateway will also continue to rent the original fleet of 44-foot houseboats that have provided lots of folks great multi-day vacations cruising the river. And for those of you who paddle, they’re now renting kayaks! One of the Gateway Marina’s houseboats, showing some of the rental condos available in Suwannee. The Suwannee River is undoubtedly, Florida’s most romantic and undiscovered river. Her headwaters start in the Great Okeefanokee Swamp, and meander southwest, approximately 270 miles through South Georgia and North Central Florida. The river was made famous in song by Stephen Foster, song writer and poet. Man has been plying the dark silky waters of the Suwannee for centuries. You will see some of the same sites they saw then,…as it was meant to be.. All Natural. You will see large majestic oak and cypress trees that have been snarled by years of weathering and wildlife of all types, that, include the White Tailed Deer, Black Bear and Wild Boars. Over seventy types of birds make the Suwannee River Basin their home or migrate here to escape the frigid temperatures of the North. The Suwannee River is also home to many species of fish. There is the Suwannee Bass, found only in the waters of the Suwannee River and the Gulf Coast Sturgeon, a prehistoric fish dating back to the beginning of time. You can observe Sturgeon leaping into the air and crash to the surface creating huge sprays of water. There are Large and Small Mouth Bass, Blue Gills, Copperheads, Red Bellies, Speckled Trout, Red Drum, and Tarpon…this truly is a fisherman’s paradise!